School Libraries are being killed off across the U.S., often by quietly defunding librarians, leaving the doors unlocked, and claiming the libraries are open to avoid criticism until it’s too late. This is a disturbing trend that Dr. Vitti seems to have effectively introduced to Jacksonville, FL. I believe it’s clear (see below) that Sandalwood, the largest school in Jacksonville, FL, is one of dozens of schools affected by District policies in this way. Please do not direct your support or opposition on this matter towards the principal or school, but towards the Superintendent (E-Mail | Twitter) and School Board. 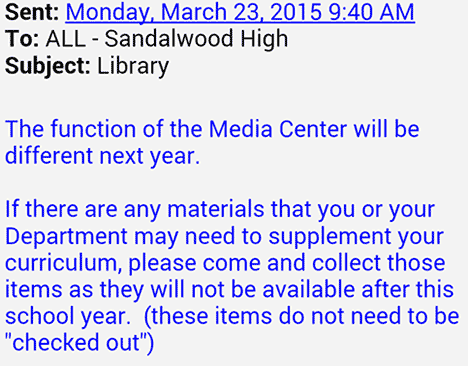 I’m often sarcastic, but this is 100% sincere: the principal at Sandalwood High School is too competent and cares too much about Sandalwood and its students to have ever wanted to close down Sandalwood’s library. And why not? 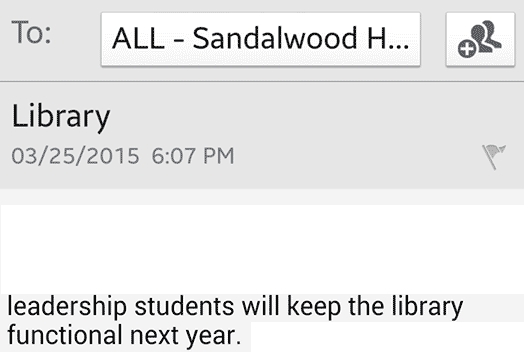 Sandalwood’s library has been dead in the water without a librarian (“media specialist”) for the past two years. So in a practical sense they might as well clear out the books and use that space for something, since Vitti is determined not to fund it. But now, after many contacted the school, District and media with concerns, leadership has “backtracked” (the exact word used by multiple sources) and stated we were mistaken; that Sandalwood’s library will not be closed. In a sense this is true; Sandalwood’s library is already closed, and has been closed for two years, along with the libraries of 31 42 other middle and high schools. At Sandalwood, I observed the former librarian teaching ESE classes full-time in the library. The doors to the library were unlocked so these students could attend the ESE class, but students were not able to research or check out books at the library. Yet the District will tell you with a straight face the library isn’t closed; District officials are literally equating “unlocked” with “open”, or in a few cases, equating “open several random hours per week” with “open”. Don’t take my word for it. Visit your neighborhood school and see for yourself. Nearly all high school libraries are in reality, closed. Most middle schools as well [EDIT: Please read update below]. I am unaware of the state of elementary school libraries but I invite feedback from any elementary school employees — I don’t need your name, just your school’s name, and I’ll do the rest. I strongly believe this is a smokescreen from the District (not the school) so the District can continue to claim these dead libraries are “open” when they are useless to students. So forgive me; when some from DCPS claim closing the Sandalwood library was never their intention, I don’t believe them; their actions speak too loudly to believe any words to the contrary. And I don’t think you should either. For anyone who doesn’t understand why this is an issue: what is a low-income/working class/homebound kid without access to the Public Library, Barnes & Noble or Internet supposed to do on the off-chance they want to read a book? Or do research? This question deeply troubles me. I believe it might be the most important question facing our schools in Duval County. I believe it’s of primary importance because it is an easily reversible manufactured crisis that Dr. Vitti is completely responsible for creating. At $65,000/year per librarian (this is roughly the figure used by the County for the full cost of a teacher/media specialist), the eliminated school librarian positions would cost roughly 1/10 of 1% of the annual budget. Vitti wasted — literally wasted — close to that on the Iowa Test that the District quietly discarded. If you have stories about your school, please contact me. I will confirm the library’s closure (or opening) myself. Feel free not to use your real name or DCPS e-mail address when you use the contact form. I have contacted the Times-Union Education Reporter about this. Please also feel free to contact other media outlets, your School Board member, etc. and let them know politely, but in no uncertain terms, that dissolving school libraries is not an option. Each school needs a fully funded, full-time media specialist so our children have easy, equal access to read books and do research. There is exactly one public high school and one public middle school left in the city of Jacksonville with a library that our students can count on.